In early 2015 I created a pilot program to help a few select agencies scale up. Big. Now we’re making all of the contents of that pilot program available to you – I want more agencies to have the intense clarity, the increase capabilities & the newfound confidence that those 8 agency owners now have. I want that for you. Over the past 8 years, WebSavvy (my agency) has grown from an idea on the kitchen table to a globally-respected, sought after agency with 10 full time & 7 part-time employees. As an E-Myth Consultant I learnt the importance of systems & have implemented these into the business. We have systems for hiring, for onboarding clients, for creating a webinar – you name it. 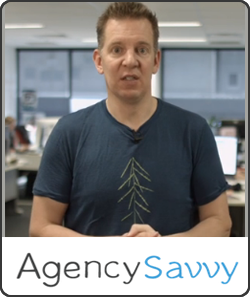 I created AgencySavvy to share the mindset, the ideas & the thinking behind all of those systems so that you can build your agency to a 7-figure business (if that’s what you want). Let’s start with what’s NOT included because I want to be super clear here – I’m not handing you copies of all of my systems! This course would cost $50-100k if I was doing that. What the course does include is training for you (& your team) to grow the 4 critical areas of your agency & scale it to the business you want: mindset, team, systems & clients. It’s based on my “Project Hourglass” – this is the model I wish someone had given me years ago & is the result of a LOT of thinking, trial & error, hard work & yes occasionally some tears! Project Hourglass is, at it’s core, a framework about how to build your business for the 21st century. We dig into a lot of detail. I share what’s worked & importantly (I think) what hasn’t. This sets up the coming work. We’ll discuss how to learn, cover distinctions about Mastery & Frameworks. Dig into Leverage, Focus & more. You’ll complete an exercise to get intense clarity about your values & goals. And I’ll request that you take daily action on those. As much as I LOVE the 80/20 rule & the leverage it brings, I believe this is the missing piece of 80/20 thinking. We’ll cover how to use the 10-80-10 framework to massively free up your time & get you focused on the work where you add the most value. The next 2 parts of the Project Hourglass framework are jammed into 1 module that will help you understand which tasks to get off your plate. You’ll complete an ‘activity audit’ & rank your current workload on a unique scale. Learning how to delegate properly has been huge for my business, I’m sure you’ll get similar results. A deep-dive into our step by step hiring system. Until I started using this system I’d hired some really unsuitable people! Which isn’t just dumb it’s potentially VERY costly for the business. Now I don’t make those mistakes, because I hire smart. This module covers the system as well as giving you useful interview questions & even job ads you can cut & paste. I’ve tried the lot when it comes to the tech on which the agency runs; Basecamp, Trello, Asana, Nutshell – we settled on Podio & I’ll explain why in this module. More than a discussion, we’ll open up the kimono & show you EXACTLY how we use Podio day to day in WebSavvy. Participants in the pilot program said this had a huge impact on their businesses – even those already using Podio! Despite being an E-Myth Consultant all those years ago, and knowing how important systems are, I still messed this up the first 3 times I tried to “systemise” WebSavvy. But we persevered & my Ops Manager Sinem did an epic job of implementing this the right way. We cover the lessons learnt & I’ll show you exactly how we document everything now – the right way. A shorter module to allow you to catch up on everything so far. And one to really cement the idea what Business = Fun! We’ll discuss the MAP you need to give your team members & a system to run meetings I’ve been using for many months that has been a huge game-changer in my own business. You’ll want to implement this asap. Yep more on systems (they’re that important). We’ll discuss some of the options available to do this (including a private invite to an excellent new tool). I’ll even give you some sample systems to get you heading in the right direction. And we’ll cover Tim Francis’ unique “Triple Path of Readership” that’s helped keep our documentation working so well. Yes I realise this may be the entire reason you grab this course (I hope you’ll go through the first 8 modules too!). We’ll cover a LOT of ground here from Dean Jackson’s ‘8 profit activators’, to Dan Sullivan’s ‘R Factor Question’ & Chat Holmes’ ‘Dream 100 List’. We’ll also discuss 12 different methods to attract those new prospects. Even more detail about how to prospect, what questions to ask in your ‘needs analysis’, how to write a proposal (including a sample proposal I use in WebSavvy) & the brilliant ‘coffee & cake’ system I learnt from Sean D’Souza. We’ll also cover getting referrals – the single biggest source of new revenue for my agency. Positioning is critical, we’ll look at how you set this up right at the start. How to Onboard clients so they look forward to paying you! Ways of reporting & how to set expectations correctly. As well as when & how to fire clients – a very powerful position to be in. We also cover the tools we use at WebSavvy to keep everything running smoothly.